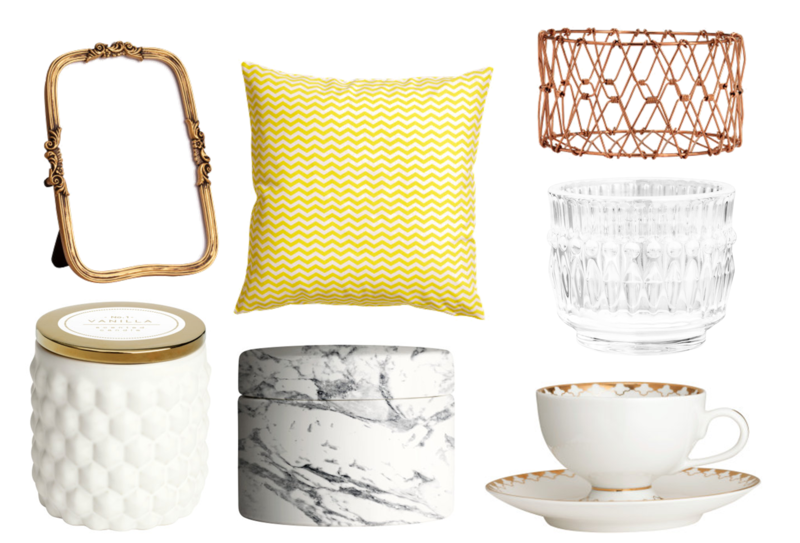 After hearing lots of great things about H&M's home range, I decided to have a little look myself at what home items H&M had to offer and it's fair to say I fell in love with many of the products that they had available. I was also surprised about how affordable everything was! As I browsed, I decided put a wish list together of some of my favourite picks. 1 // Metal Photo Frame. I love the style and design of this frame. I have many frames with photos in hanging on a small section of my bedroom wall and I like to hang them in mis-matched frames and this would be a really nice addition. I've seen the copper theme within homeware around a lot recently and I'm really starting to warm towards it. 2 // Yellow Cushion Cover. This cushion will add a little colour into your home. It's a lovely colour and perfect for spring. I also love the zigzag design. 3 // Metal Wire Basket. Another item that I really liked along the copper theme. This metal wire basket is great storage for any room in your house. It can also be folded into slightly different shapes which is a nice extra to the design. 4 // Scented Candle. This is a vanilla scented candle and although vanilla is not my favourite scent when it comes to candles, I really like the jar that it comes in more than anything. Although, I'm sure it smells lovely too. 5 // Ceramic Pot. This is one of my favourite picks of the bunch today, although I can't seem to find it online anymore which is a shame, I'm thinking it might have sold out. I really like the ceramic look and think it's handy to put my hair bobbles or slides in so I don't keep losing them! 6 // Glass Tea Light Holder. This glass tea light holder is only £1.99 which I think is such a steal. It looks a lot more expensive. A couple of these would make a really nice decoration for around the house. 7 // Coffee Cup and Saucer. This is my favourite item that I found on the H&M home website. I drink a lot of different kind of teas and hot drinks in general, but I don't have a tea cup. Once again, I love the copper detailing along the edge of the coffee cup and the saucer. What is your favourite item from the wish list? Have you shopped at H&M home before?